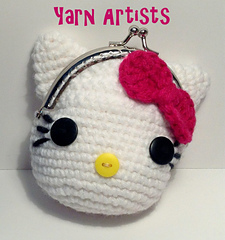 This Hello Kitty Inspired coin purse would be cute for anyone from toddler to adult!! I will be including these in my craft shows from now on. I stuff them with some paper towels to give them a nice shape, so customers will have a good idea of the amount they can hold. I had fun making and writing this pattern. I hope that I gave you enough photos and written instruction for you to recreate it. I would consider this pattern to be EASY. Once you get the basic shape down, you can make endless designs of your own. So have fun! !